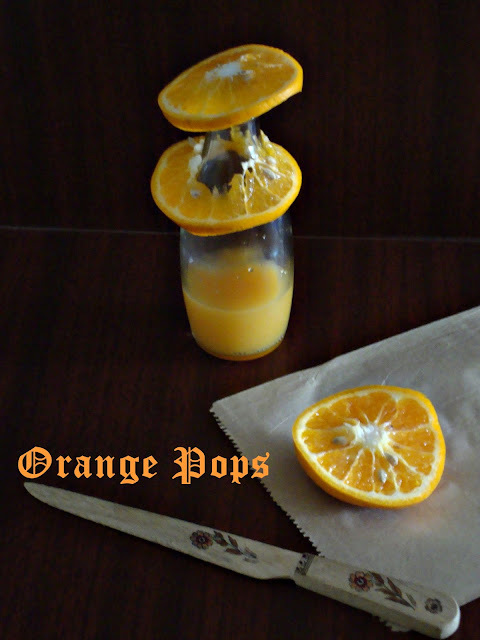 Though I am with a very simple Orange Popsicle post today but it's not the basic recipe but the story behind these summer favorites. Few days back an Ice Cream vendor cycled past my apartment ringing bells to attract people. This sight took made me to remember many years in past in my Haridwar township when I was studying in Standard 1 or 2. During peak summer temperature used to reach 45 degrees and people did not venture outdoors unless absolutely essential. However, when we used to hear the same tinkering sound most of the kids used to ignore the scorching sun and run towards the vendor with two rupee coins ( believe it or not starting price of ice creams used to cost only that much during those time). And the most popular flavor used to be Orange sticks (popsicles) which is an all-time hit. And since it was so hot outside my mom then devised a way to keep us indoors by preparing these popsicles at home itself. 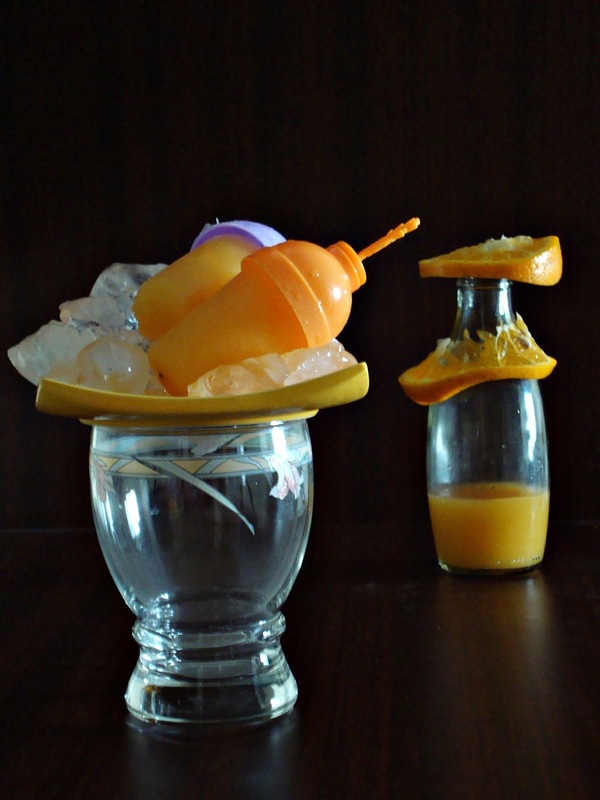 Since the contents were only water, orange juice and some sugar, it was no big deal to prepare it. 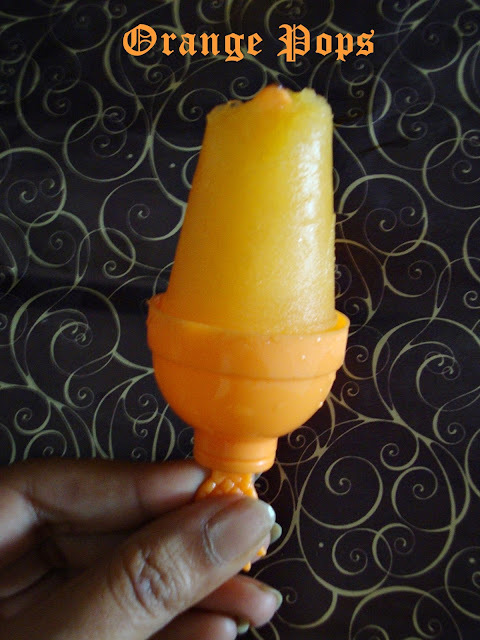 So after many years I was reminiscent of my childhood days when I used to crave for this popsicles. If using wooden ice pops then soak it for an hour in warm water. In a large container add everything and stir until well combined. Then carefully pour into popsicle molds. Freeze for about 4-5 hours or until firmed. To release the Popsicles fill a large bowl with warm water and dip the molds in it for few seconds. refreshing and tempting ice pops. perfect for this summer ! Prefect pops for summer, feel like relishing some. Defect for summer. I remember eating orange bar as it was called as a school kid in Delhi! That is delicious yummy pops, beat any heat. Wow!! drooling here! these look absolutely fab! nice clicks and great presentation. tomar ei popsickle dekhe sei chotobelar pepsi'r katha mone pore gelo. ki sundor rong hoeche.